In August 2003, I was very fortunate to take a driving trip of the Yucatán Peninsula with my husband and our dear friend Martha (@martharees). They kindly allowed me to heavily dose myself with visits to archaeological sites. 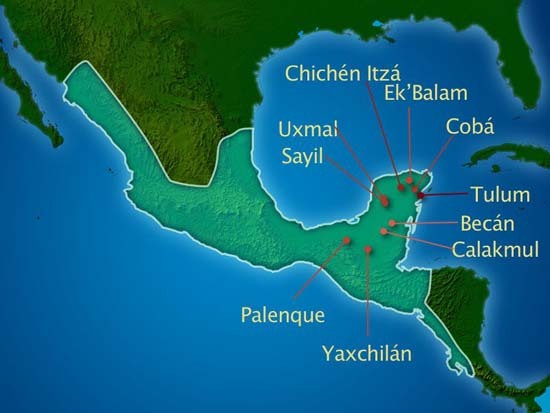 It was, after all, my first visit to the Yucatán. I’ve posted just a few images for each of the sites. Know that if you visit them, you will encounter only modest enlightening signage, but ample amounts of eye candy in the form of ruins. Most tourists who join tours from Cancún visit Chichén Itzá, which is awe-inspiring for its size, but the massive crowds can be a short-coming. You’re lucky if you visited this site years ago, because many of the most famous buildings are now closed. While this protects their irreplaceable artwork, today’s tourist has a far different experience visiting the site. Many people also take shuttles to Tulum. The scale of the civic-ceremonial architecture is small—this site dates to a later period than the rest listed here, but the site’s location perched above the ocean is outstanding. This was a trading port, catering to canoe trade along the coast. Its architecture seem to be miniatures of the towering Classic structures you’ll encounter at most other tourable sites. Another widely visited site is Uxmal, known for its huge closed plaza, faced on each side by buildings with somewhat different motifs on the facing walls. I think some people who visit Cobá expect it to resemble Chichén Itzá or Uxmal, but the largest pyramids are rather dispersed, and the vegetation remains, so you wander through paths in the jungle. Some opt to rent bicycles, but I enjoyed walking, especially down the raised sacbeob to outlying areas. Try to visit Ek’Balam, which is packaged with some Chichén Itzá tours. Although the site small, the sculptural details on the largest temple-pyramid are outstanding. You also will be aware that the central architecture was walled off (actually, by double walls! ), while at Chichén Itzá you will probably not even notice the surrounding wall, although you cross it on the way to the most popular cenote. Without a doubt, the most gorgeous site that we visited was Palenque, but its location on the south-facing slope of the Chiapas Mountains, overlooking the flatlands of the Yucatán, makes it positively spectacular. We arrived at the site early, ahead of several bus-tour groups, and went up to the highest areas of the site (open to tourists) right away, enjoying the gestalt of the site as the morning fog burned off, serenaded by hooting howler monkeys. To get to Yaxchilán, you must hire a launch to take you to the site from the modest town of Frontera Corozal. Yaxchilán is on a wide landform almost surrounded by a loop of the Usumacinta River. We wandered this site when it was almost drippy with moisture, although it didn’t actually rain. Scrambling up the paths to reconstructed temples on the high ground away from the river meant braving slippery rocks. But, oh, the view! I found Calakmul inspiring. It’s at the end of a long road that goes nowhere but to this site through a protected biosphere—no villages, nothing. As with Cobá, Calakmul is still tree-covered, so you find walking in the shade cooler, but envisioning the size of the plazas, open of course when the site was occupied, harder to visualize. If the insects mob you, climb to the top of a temple and you’ll leave them behind! I’m sure Sayil gets few visitors. While its central civic-ceremonial architecture is impressive (can’t enter or climb it), most people would say there isn’t much else there. I was fascinated, however, to wander the paths and investigate partly excavated range structures and imagine what it’s like to hack your way through the vegetation to find and record such structures. Then, after realizing how sweaty-nasty that would be, I would happily remember working in the Mixteca Alta! Becán is just off the east-west highway in Mexico that parallels its border with Guatemala. Its central architecture is protected by a broad ditch—or maybe it’s not so much for defense, but to indicate that without a doubt, you’re entering a special precinct when you traverse the ditch. We wandered and photographed Becán while it rained….